The Australian Catholic Disability Council and the Disability Projects Office of the Australian Catholic Bishops Conference have released today a new resource for parishes and Church communities called One Body in Christ, Welcoming People with Disability. 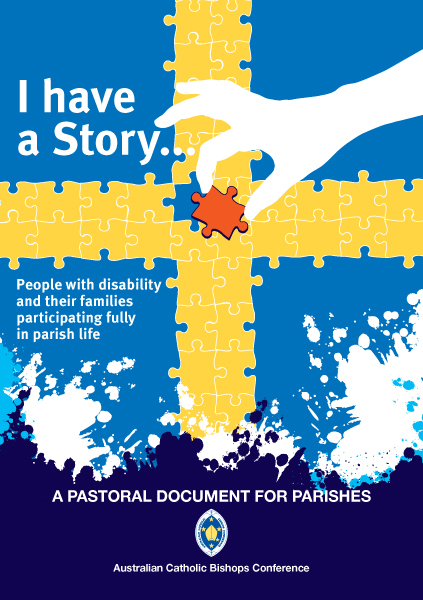 This parish resource kit is beautifully designed and contains a number of excellent resources for those working with people with disability. It is useful for clergy, religious, pastoral councils, teachers, parishioners and anyone who has an interest in welcoming people with disability. Mrs Patricia Mowbray, Disability Projects Officer, managed the project with the assistance of the Australian Catholic Disability Council. Mrs Mowbray explained that, “The Shamrocks collated and packed the kits ready for posting to every Catholic parish in Australia.” The Shamrocks is a small social enterprise that promotes work-ready skills and social opportunities for people with intellectual disability. “Their engagement in this project is a testament to the Church’s commitment to the full participation of people with disability,” she said. Inside the kit, there is an updated version of the pastoral document for parishes, I Have a Story, which the Bishops Conference first published in 2004. The kit also includes the book, We Have a Story, which tells the stories of people with disability in Catholic parishes across the country. There is a new check list that parishes and other Church agencies can use to reflect on how they welcome people with disability and how they can respond. One Body in Christ, Welcoming People with Disability, is available for $20 by contacting the Secretariat for Pastoral Life at sales@catholic.org.au or 02 6201 9850. More information about the kit and how the Church can welcome people with disability is available from the Disability Projects Office at disability@catholic.org.au or 02 6201 9868. For media enquiries or to arrange an interview with Mrs Mowbray, please phone Beth Doherty on 0407 081 256. Thank you for your disability-friendly information. I have a different problem – my local parish is disability-friendly, and the priest is happy to have my boys at Mass. However, they are both severely autistic, with many sensory issues, and they don’t like the noise and the number of people at Mass. They were baptised as babies, but have not received the sacraments of Reconciliation, Eucharist or Confirmation because of these issues. Do you have any ideas as to what we could do for my boys please? Many thanks for your comment. If you would like to be in contact with Patricia Mowbray on disability@catholic.org.au, she will be pleased to speak to you about these issues, and help you and your family. I will pass your message to her.